It all started in Granada, at the end of last summer. Jam, so sick of being stuck on a small boat for weeks on end, booked us into a fancy hotel somewhere away from the sea. I, quite desperate for a nights sleep in something under 100 degree temperatures on ground that didn't rock back and forth, was happy to oblige. We stayed in the old Moorish part of town, with windy cobbled streets that wound their way up a hill that faced the Alhambra. We explored the Alhambra, and wandered around the markets, and went to the Hammam, and slept soundly for the first time in weeks. One day, while walking around the old markets, we passed a tiny little shop front with rows of baklava in the window. Hungry, and curious, we stopped in. The woman, hair covered in a Hijab, spoke broken Spanish. The walls were lined with teas and oils with labels all in Arabic. We pointed at things and she handed them to us. We bit into them and made noises. She smiled and handed us more. On the day we left, to drive to Madrid, I ran down to the shop, waited 45 minutes for it to open, and bought every single pistachio baklava she had. Our drive to Madrid was sugar-fueled but happy. Of the many things that make me with teleportation were possible, those baklava are near the top of the list. Last week Jam and I went for a hike in the San Bernadino mountains. We gathered and munched on a bag full of fir tips, and wild roses for Wild Rose Elixir. We hiked a few miles, to a bubbling stream, where we wet our overheated heads and splashed our feet around. We picnicked, on fresh apricots and sharp cheddar and roast chicken and fir tips, and then we played around for a bit, while I took photos of plants and Jam threw his new tomahawk at dead trees. Later, on our walk back to the car in that perfect late afternoon light, I gathered a few Jeffrey pine branches. For those of you who don't live in Jeffrey pine territory, they are like Ponderosas on crack. For those of you who don't live in Ponderosa pine territory, just picture a pine tree that, in the heat of summer, radiates the smell of butterscotch, vanilla, pineapple, and resin, so that the air around you is full and fragrant and resinous and warm. Picture a smell so delicious that you are incapable of passing a tree without burying your nose in it and inhaling. "what if you made baklava with this?" So. 3 attempts later, plus some happy dinner guests, here's a recipe. Infuse some honey. If you have access to Jeffrey Pine (pinus Jeffreyi) then use that. If Ponderosa, then use that. If not then find the most fragrant conifer you can. Douglas fir is gorgeous, as is white fir and Ananda sent me some delicious fir from the East coast earlier in the year... Redwood is delicious. Spruce is yummy. Get creative. Get out there. Bury your nose in trees and taste needles. When you get it home, chop it up and cover it with honey. For this recipe you'll need about 1 1/2 cups. The rest is yours to do what you want with. Drizzle it over toast, into tea, onto fingers. Whip it up with cream, use it in hot chocolate. Try and keep it around for more than a month (you won't be able to, promise). Make the warqa. For ease, here's the recipe I used. Because I have gluten issues, I *may* have sprouted, dehydrated and ground my own wheat. I also *may* have soaked the batter for an extra long time and added some raw milk to break down the gluten molecules even more. If you have slight gluten issues and desperately want to eat these, I recommend doing this too... if you want specific instructions just let me know and I'll type them up. 1. Add more water than the recipe says. When its thick it doesnt spread on the pan properly. A thin watery batter spreads on really nicely. 2. The pastry brush is really really necessary. Any kind of brush will work. A paintbrush would work. Just as long as its brush-y. 3. Don't accidentally dislodge your pan. Steam burns hurt. 4. If I weren't gluten intolerant I'd buy filo dough in a heartbeat. Grind up the pistachios till the largest pieces are lentil-sized and there are lots of smaller ones. Take out a handful (for decoration, then throw the rest in a bowl, along with the spice, orange blossom water, honey, and salt. Mix it all together thoroughly. It should be a thick paste that holds together and doesn't spread out too much. If it is too runny, add more pistachios (or in dire straits, strain out some of the excess honey). Brush a baking sheet with melted butter, then set out 3 of the warqa sheets, so that they overlap, in a row. The edge of the first and the edge of the last will be pretty close to each other. Then, about 6 inches in, dollop a row of the pistachio mixture along the warqa. Start rolling the warqua over the pistachio mixture, buttering it at each turn. 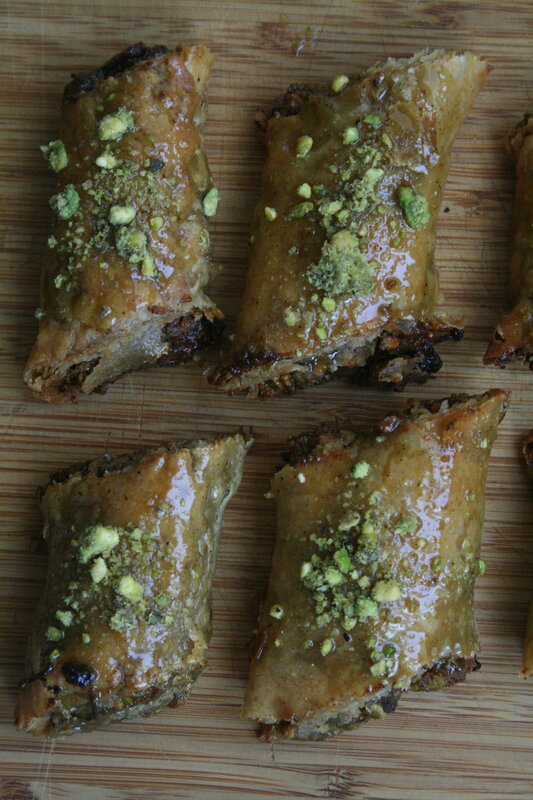 When the whole thing is rolled up, place on another oiled baking tray, slice it, then repeat with the remaining pistachio/pastry. Here's a video of someone doing the same thing, with filo sheets (because this process is difficult to explain). Start at 3:30.